Welcome to Michaels Floor Coverings! For more than a decade, we have been a trusted choice for a variety of flooring products and services, which remained to be unrivalled by other contractors in Louisville and the surrounding areas. Our local, family-owned and operated business is committed towards the provision of nothing but superior quality and the highest level of customer satisfaction. After you have tried our services for the first time, you will surely have to recommend us to your friends and family, and you will end up working with us again in the future once the need arises. Our company takes pride in offering a wide array of flooring products and services, regardless of whatever your flooring needs are. Whether it is carpet, vinyl, hardwood, tile or laminate, we will be able to extend a helping hand. All of our products are high quality brands you can trust which is most probably one of the reasons why we were given positive feedback by our clients in the past. Aside from selling products for your flooring needs, we also handle repair and installation. Through the years, it is inevitable that your floor will suffer from some wear and tear and become not as aesthetically-pleasing as it was in the past. With our repair services, we will help to maintain its best look through an extended period of time. Meanwhile, we also have a professional team of experts in flooring installation. We use the most advanced techniques and materials possible to ensure the best installation of every job. Customer satisfaction is the top priority of our company in all sales and installation services we provide. Even with the abundance of the choices available in the marketplace, it can be challenging to find one perfect for your budget. With this, you will surely not regret choosing us since our prices will not hurt your pocket in any way. They are all very affordable, but the quality and service is never compromised. As part of making our services affordable for all of you, we are also proud to offer our financing options. We can offer 12 months no interest and extend it further to 36 months to make it even more reasonable. Because of this payment plan, there is no more excuse for you to not have the floor you deserve! 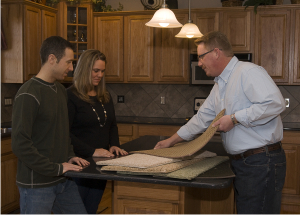 Schedule your free estimate, and we will let you know what we can do to help you with our flooring products and services, which will be tailor-fitted based on your individual needs. As a premier flooring company in Louisville and surround areas, we guarantee the highest quality and innovative flooring solutions for all.